While chance and luck play a role in all TCGs, there is often a debate as to whether some games have begun to favor luck rather than skill. If a game requires no luck it becomes deterministic and predictable, punishing new players and being unenjoyable for the audience. Likewise if luck is too prevalent the randomness of results would discourage more experienced players from participating, devaluing any concept of a competitive nature in the game. Comparing the aspects behind luck in Solforge and other TCGs, such as Magic and Hearthstone, one might be able to strike an ideal balance between luck and skill that players can attempt to control, and game designers should strive to work around. Remember, when you win it’s due to your skill, but when your opponents win they just got lucky. In each game the first matter of luck a player will encounter is the turn order, whether they will be going first or second. In a two player game this is a coin toss with 50% chance of ending up in either position. Of course it is generally perceived that there is an advantage to going first, how big an advantage that can be depends upon the game's resource engines and how tempo plays a role. Because of this advantage designers usually set counterbalances in the form of additional bonuses to the player going second. In Magic you can either play first or draw an additional card. In best-of-3 matches the loser of each match gets to decide who will play first in the next round. Card advantage plays a big role in the game, as more cards means more possible paths of play, but also because magic's resource system required to play creatures is in cards itself. Despite the fact that a slight card advantage is given to the player going second, a study of 200 MTG matches found that simply drawing extra cards may not be enough, and that players going first have a 53% chance to win, to the second players' 47%. While these findings are within the standard deviation of a 200 match study, it still manages to show the clear advantage to the player going first and the importance of trying to design around that. 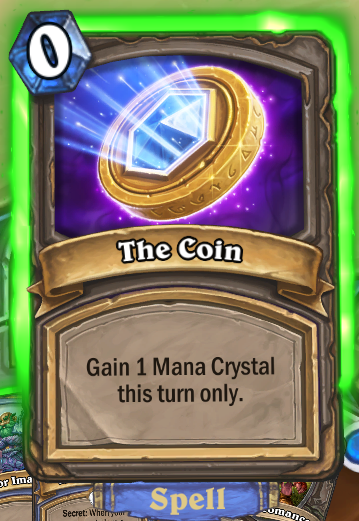 Another popular TCG, Hearthstone, goes above the card advantage by providing additional resources through "The Coin" to the second player. Because Hearthstone's resource system is definite and will always increase by one per turn, as opposed to Magic's land system where a player can miss a land play, it is necessary for a balance to even the resource tempo between the two players. The first player will get their additional mana crystals before the second player each turn for the first 10 turns, the coin helps counteract this by generating tempo and putting the second player ahead of their opponent for a turn. Like in Magic the additional card draw at the beginning of the game provides the minor advantage of being more likely to see the early-game cards or answers that are needed. Because Solforge is not reliant upon a resource system to play the cards, getting a guaranteed two plays per turn, it is harder to balance the disparity between the first and second players. The discard system at the end of turn destroys any chance for card advantage being a fix. Interestingly the way in which SBE chose to handle it seems more like a disadvantage is placed upon the first player, where they level one less card in the first rank than their opponent. But the first player sees their 2.1 turn before opponent. This lets them be the first person to get leveled cards on the board, cards that need to be answered, which controls their opponent's subsequent plays and generates tempo. Cards like Dysian Broodqueen are far better when they come down before the opponent's on-level cards. The question is how much does a single extra leveled card affect this disadvantage? The second player has a 5% greater chance of seeing a leveled card at the beginning of rank two. However, 3% of that advantage includes drawing more than two leveled cards in a hand, a situation in which at least one of the leveled cards will go unplayed and may as well not have been drawn. This shows that a player going second only has an insignificant 1.8% chance of drawing their leveled cards in the beginning of rank 2. Often overlooked is the fact that it's not just a card being leveled, but an additional level one card being placed on the field. While unleveled cards don't hold much weight against level two and three powerhouses, it gives an early tempo advantage to the second player should they get threats onto the board. Decks like Zoo that play large creatures to the board that need to be answered quickly are able to make more of this additional rank one play than more controlling strategies. Truthfully, the additional play given to the second player only hardly effects early game board advantage, and doesn't significantly affect the chances of seeing your leveled cards at a later point - putting the player going second at a disadvantage. And less importantly factored is how the card stands up to popular removal in the format. A person wouldn't want to play a Killion or Tomb Pillager in the first turn of a new rank, so it limits the plays available to them. Likewise, you wouldn't want to play an Ebonskull Knight on 1.4, or a Weirwood Patriarch to an empty board. If a player runs three copies of a card in a 30 card deck, there is only a 2.96% chance to miss drawing at least a single copy in the first player level - implying any of the underdrop cycle cards should only be run as two-ofs. Because the sequencing of draws can be majorly important to a deck, it is up to the player to attempt to manipulate them in their favor. As mentioned previously, card draw and card advantage can often decide the winner in other TCGs. Almost all non-aggro decks in Hearthstone and Magic run some form of card draw to put their resources ahead of their opponents. That being said, not all card draw is equal. Some classes will have more draw-effects than others. In Hearthstone rogue and druid decks seem to have more cantrips, cards that draw another card once played, available to them. Magic has another deck-manipulation effect that is popular in the form of scry, where they can dispose of any unwanted cards from their future draws, available in all colors. While Magic’s main card drawing color is blue, other colors occasionally see draw spells despite coming at additional cost. The point I’m trying to get at is that each class in Hearthstone, and multiple colors in Magic have the ability to draw cards or manipulate the top of their deck, which is not the case in Solforge. Of the hundreds of cards in Solforge, only nine of them cause players to draw cards. Eight of these nine are Alloyin. 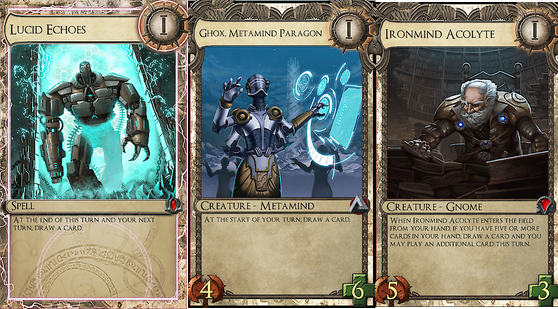 Five come from the metamind creature class, which allows cards like Drix to be fueled by the additional draws. The other three are more interesting, Lucid Echoes and Energy Surge both allow the player to draw by sacrificing a play. If a player isn't discard leveling them via another source, such as Oratek Battlebrand, it causes a tempo loss if you want to play them early - with the upside that Echoes will affect your next two turns and Surge will be free for the rest of the game. 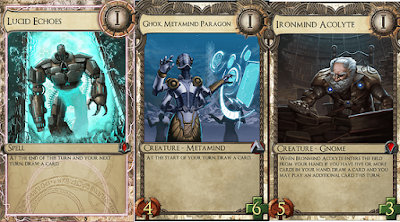 Ironmind acolyte fits in with these other effects, only drawing cards contingent upon if you had drawn already the turn he is played - but also generating free board position which could have been lost while drawing cards. Card draw can be a very powerful effect, but the only viable options currently are within the Alloyin faction whose entire identity lends itself to being a support faction rather than a main one. Magic's secondary color that has the capability to draw cards is black. In addition to the mana resources, black card draw often costs a player a portion of their life. 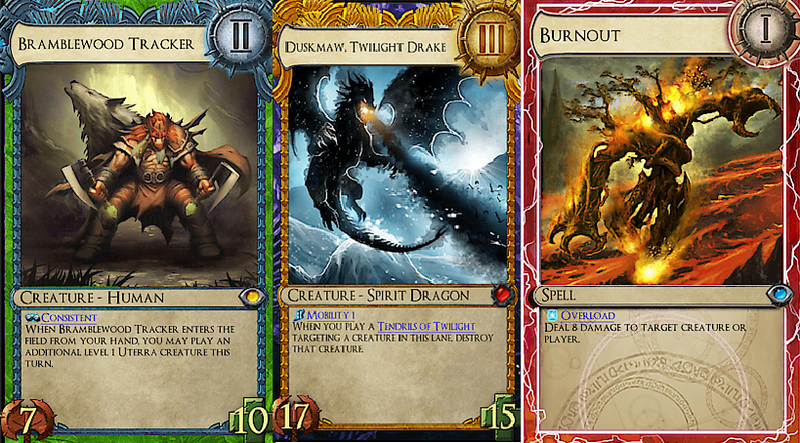 It is this mechanic that can lend draw effects to other colors within the realm of Solforge. Drawing might not traditionally fit within the flavor of the other three factions but it can be generated through Nekrium sacrifice, as shown by the only non-Alloyin draw effects being in that faction. 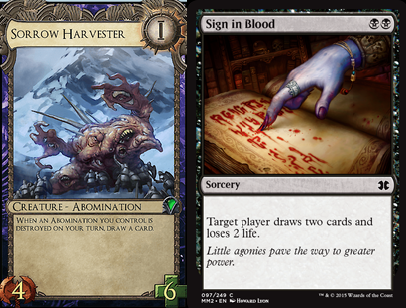 The only problem with this is that Sorrow Harvester is often unplayable. 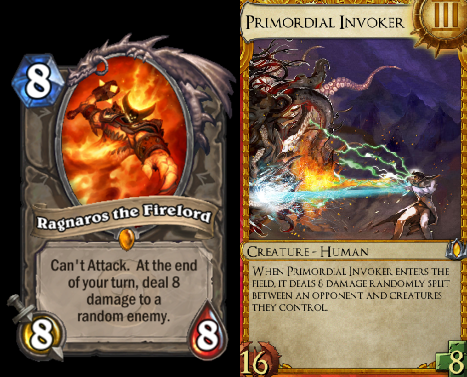 It is forced to sacrifice proactive and defensive plays because the card draws occur after combat, and is less controllable. Draw effects need to be present in factions other than Alloyin, but flavor-wise there needs to be additional costs for those extra cards. Unfortunately in the current state of Solforge the lack of card draw effects and the discard mechanic create an environment that is unforgiving for removal spells. As former competitive magic player David Price said, "While there are wrong answers, there are no wrong threats". This beatdown mentality is doubly true in Solforge, where even if you draw your answers before your opponent plays their threat, you will be forced to discard it. This end-of-turn discard, and lack of cards that allow you to hold onto them make it difficult to design removal. Most decks will run a majority of creatures, with only a handful of removal spells, that are soft-gated so they don't need to be seen early, like Dendrify. Unfortunately this means there are very few decks reliant upon control, meaning the meta game is stuck in constant beat-down mode and rarely sees play going anywhere near rank four. One of Solforge's more unique mechanics is Consistent - the ability to guarantee that a card will be drawn in a given player level, normally granted the ability after it has been leveled once. This ability is clearly strong when applied to creatures with decent stats or abilities, resulting in Bramblewood Tracker and Ashurian Flamesculptor both being hit with the nerf bat after their time dominating tournaments. There is simply the matter of how much the consistency is actually worth in card stats. Can a card have average stats or a strong ability and still be consistent? The ability to constantly see the card is important to valuing it, but it is also dependent on whether or not can be a bad draw at a given time. In the current meta, most players are more likely to be using solbind cards that decrease the consistency of their deck or overload cards which level less cards over time than actually include cards with the consistent mechanic. While solbind cards interfere with your draws, sometimes the affect attached is good enough to make up for it, similar to Overload's deckthinning capability making up for not having leveled a card. Another way for design to approach utility in draws is to make more cards that can be used effectively at different points. Modal cards, which give the player a choice as to which effect they want, are able to generate more usefulness under various circumstances than having a card with a single effect. Modal cards are typically more versatile, being able to be both proactive and reactive depending on the position of the game - and have found a great deal of popularity in Magic. Because they can be used for multiple purposes, this style of card has can have inherent value regardless of when they're drawn. Reign of Varna introduced a set of these across the factions at the rare quality which have proven to be useful in draft, but there should definitely be more cards like this created in the future to preserve the health of the game. One of the more interesting forms of chance is in random effects generated by the cards. Clearly this is influenced by at least one of the players, as they chose to put the card in their deck, but what would influence a person to choose randomness over consistency? Random cards see play if you can mitigate the potential downsides and try to turn the effects in your favor. While Magic has done away with almost all chance-based card effects, with the most recent one being the result of a guest designer, Hearthstone has embraced the concept of luck in their card pool. 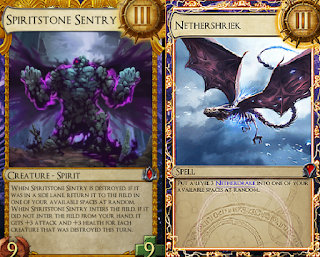 The different places at which random effects enter card design in Solforge determine the amount at which the chance factor can be controlled. A degree of randomness that's unique to Solforge is the concept of lane placement, and the ability to place creatures at random. Because of the 5 lane system we can expect any minions summoned to a random lane to have a 20% chance of ending up in any individual lane if the board is empty. By simply dropping more creatures on the board the chance of getting the card where we want rises considerably.If you're able to control the board well enough a Nethershriek is hardly a random effect. And many constructed players know that Spiritstone Sentries end up hitting the sidelanes more often than not. 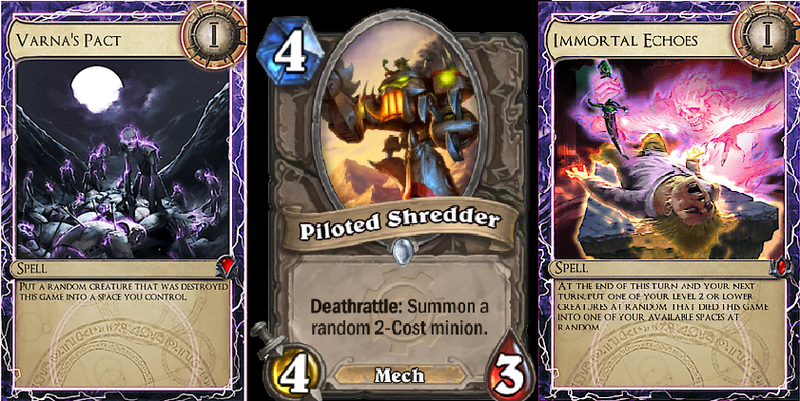 One of the most played cards with a random effect in Hearthstone is the Piloted Shredder. While the card you get will be completely random, occasionally getting you a Doomsayer (1/67 chance), the average stats of the two creatures combined will usually be well above the 4/5 average that four mana typically grabs. This looks at the possibility of randomness pushing a below-average card above the norm, but not having it guaranteed to the player. Solforge doesn't have strict random summon effects of this nature, but has cards like Immortal Echoes and Varna's pact which pull from the pool of dead creatures. Because these cards look at existing dead pools, they can be controlled by the cards you play and let die on your field. Because Pact had a nasty tendency to pull back various 1/1 broodfangs and the like that your opponent sacrificed, it became too unstable to realistically play at a competitive level - being outclassed by Echoes because you have greater control over your own graveyard than the combined one that your opponent uses. Of course, this can be combated by cards such as Dendrify and Phytobomb,but neither of those are cards that you would want to play early. It would be interesting to see an effect that can summon a random on-level minion of a given faction added to the game. The idea of number-ranges on cards creating variance follows the idea of the Piloted Shredder, where it can either be ridiculously strong or underwhelming depending on how RNG factors into it. Of course randomness takes away from the competitive edge of a match, but being able to use luck to dig yourself out of a bad situation feels amazing. The problem with this aspect in Solforge is that it currently is only used in direct-damage spells that target the other player. Not being able to affect the boardstate puts a player noticeably behind, and isn't worth the damage to the face unless it's the killing blow. Because of this Draconic Echoes and Disintegrate don't see any play, despite the possibility of being a cool finisher. The number variance has to play effect with the board in order to be worthwhile, cards like Implosion shown above can result in huge swings in board advantage, or fall about average. Randomness can't just be directed at a player, but needs to have an affect on the game itself. The final form of randomness in card effects had an interesting shift in Solforge with the addition of Primordial Invoker. Random targeting of opponent's creatures had only previously been seen in Death Current, which was difficult to justify because it was hard level-gated. While the player may not completely control where the damage is going with the Invoker, they can minimize the targeting options by controlling the board. If it only targeted creatures and the damage couldn't go to the face the card would be strong, able to pick off creatures that barely survived combat or sending 4-8 damage to whichever creature was still remaining. As looked at with the random numbers behind Draconic Echoes, sending damage to the face is not ideal, and having that occur before controlling the board is what sets this card behind. Random batch order triggers are the most complained about among the chance effects within the game, due to being the most arbitrary of the groups. 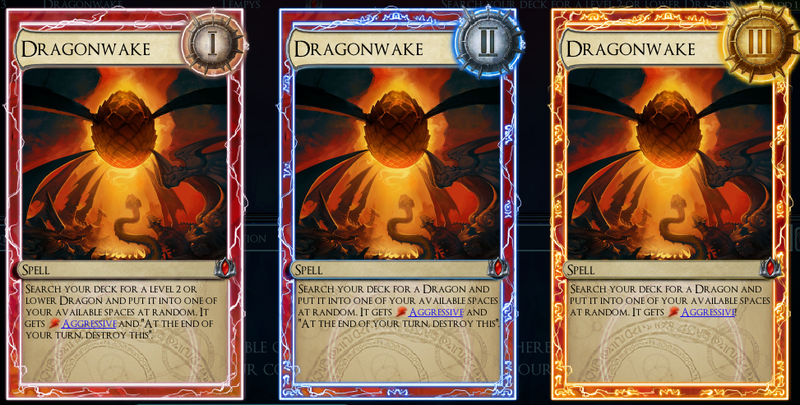 People expect there to be RNG in draws and expect there to be RNG whenever the word "random" shows up, but there should not be random effects within game rules. Batching is what kills people because there is absolutely no player influence, and it creates a sense of helplessness instead of balance when it comes to the rule. For those unfamiliar with the rules, when multiple triggers are created by the same action, they are resolved in a random order. Each time you play a Weirwood Patriarch overwriting a Nova sapling, there's a 50/50 chance of her being either a 4/8 or a 6/10 from the interaction. There needs to be a more specific rule set put into place that governs this. Having the stack system like Magic would be difficult to program, and place a burden on the players navigating the system. However a quick fix could be implemented by simply switching the code so that the batch orders happen in a given order - having cards enter the field trigger before those already on the field, or vice versa. By creating new rules to remove randomness in game rules, players will gain more control over their matches. Rules systems need to be strict, not containing any chance in them.